A self-portrait featured in "Van Gogh: Brush with Genius." ©Camera Lucida. Vincent Van Gogh’s paintings will not just be at the National Gallery of Canada this summer but, in a manner of speaking, also taking a starring role at the Canadian Museum of Civilization. The IMAX Theatre at Civilization will be showing the 39-minute film Van Gogh: Brush With Genius from May 18 until Sept. 3, corresponding to the National Gallery exhibition Van Gogh: Up Close running from May 25 to Sept. 3. The film is directed by Peter Knapp and Francois Bertrand in partnership with four major European museums with Van Gogh works. Civilization had a test screening of the Van Gogh film a few years ago to see gauge audience reaction. The response was evidently positive enough to encourage the museum to show the film this summer in conjunction with the National Gallery exhibition. With an actor providing Van Gogh’s voice, the artist describes his last years of painting in France. We see the actual fields, roads, and buildings that Van Gogh visited and painted. 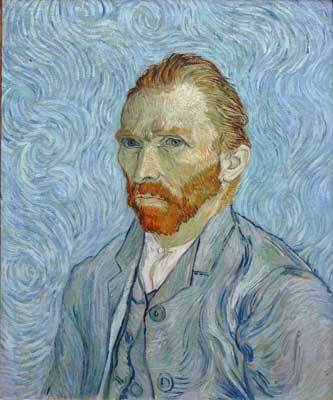 But the most breathtaking aspect of the film is the way we see many of Van Gogh’s paintings in extreme close-up. The paintings become almost like 3D sculptures. Van Gogh slathered paint on his canvases in thick streaks. The IMAX experience gives you the feeling of actually entering the paintings and exploring the hills and valleys of his brushstrokes. 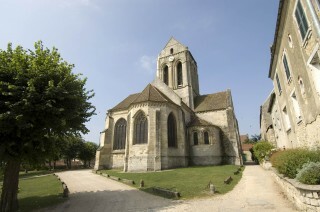 A church featured in the film that is represented in one of Van Gogh's paintings. ©Camera Lucida. Van Gogh was born March 30, 1853 in Groot-Zundert in the Netherlands and died July 29, 1890 in Auvers-sur-Oise, France following complications from a gunshot wound. For more than a century, the prevailing view was that Van Gogh shot himself, but a new biography by Steven Naifeh and Gregory White Smith published last year forwards the theory that Van Gogh was shot by some neighbourhood toughs even though the artist said he pulled the trigger. Many mysteries remain about Van Gogh. There is the incident in which he sliced off part of his ear. There are many different theories on that. And then there is his supposed mental illness, resulting in a few long-term stays in asylums. Was he really crazy? And how did all these factors affect his art? Opinions are divided. The IMAX film touches on some of these topics, as does the National Gallery exhibition. But don’t expect concrete answers to the many enduring Van Gogh questions. “In less than a century I became a myth when all I wanted was to become a painter,” says the actor portraying Van Gogh in the film. For many Van Gogh fans, the myth is as alluring as the paintings. For information on the film, visit www.civilization.ca/imax. For information on the National Gallery exhibition, visit www.gallery.ca/vangogh.